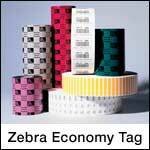 The Zebra 7 mil tag is an economy, uncoated, thermal transfer paper tag stock with excellent ink receptivity. Ideal for general purpose ticketing, shop floor tracking tickets, retail hang tags, and inventory control tags. Use with wax ribbon. 3.00" x 1.25" thermal transfer 7.5 mil tag on a 3" x 8" core. 3750 labels per roll / 6 rolls per case. Zebra 67251 special features - Non-perforated. Use with wax ribbon. 3.25" x 5.00" thermal transfer 7.5 mil tag on a 3" x 8" core. 1030 labels per roll / 6 rolls per case. Zebra 65156 special features - Non-perforated. Use with wax ribbon. 3.25" x 7.38" thermal transfer 7.5 mil tag in a fanfolded pack. 860 labels per pack / 4 packs per case. Zebra 67850 special features - Non-perforated, Fanfold. Use with wax ribbon. 6.00" x 3.00" thermal transfer 7.5 mil tag on a 3" x 8" core. 1610 labels per roll / 2 rolls per case. Zebra 18504 special features - Perforated. Use with wax ribbon. 4.00" x 6.00" thermal transfer 7 mil tag on a 3" x 8" core. 860 labels per roll / 4 rolls per case. Zebra 72352 special features - Non-perforated. Use with wax ribbon.